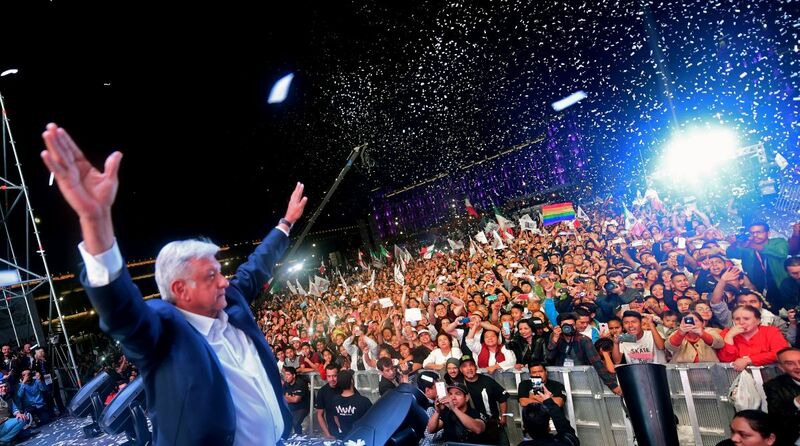 Andrés Manuel López Obrador, also known as Amlo – an acronym formed using the initials of his name – has won the presidential race in Mexico. Andrés Manuel López Obrador, also known as Amlo – an acronym formed using the initials of his name – has won the presidential race in Mexico. The 64-year-old leftist politician, who has promised to carry out “radical transformation” in his country and “eradicate corruption”, dominated the polls on Sunday holding a 20-point lead over his rivals. Three of his main rivals conceded defeat within two hours of polls closing. Born on 13 November 1953, Obrador began his career in politics as a member of Institutional Revolutionary Party (PRI) in 1976, and eventually became the party’s state leader. In 2002, he was elected mayor of Mexico City for the Party of the Democratic Revolution (PRD). The President-elect has promised to “achieve peace and end the war” in Mexico, referring to the ongoing conflict between the government forces and the notorious cartel. He said that he will not continue the military-led “war on drugs” strategy executed by current President Enrique Peña Nieto and his predecessor Felipe Calderón. But Obrador has been vague about his own planned security policy. Also, he has already said that he would name a new negotiating team for the NAFTA (North American Free Trade Agreement) revision. In 2006, Lopez made his first attempt to bag the presidential race but lost against Calderón in an election which is considered Mexico’s most controversial in modern history because of the difference in votes being just 0.56 per cent between the two. He tried again in 2012 election but was prevailed over by PRI candidate Peña Nieto.